The subject of which knife is the best to carry can get very heated among knowledgeable blade enthusiasts. Actually, no one knife can do everything. I have well over a dozen fine knives, several hand made to my specifications. But are they better than an off-the-shelf design by a good custom knife maker? To be honest, they are not, but I like them anyway. It would be very boring to get into a long discussion of the various steel compositions used for knives today. 440C was the first good stainless, but 154CM and AUS-8 are reputed to be better...I have blades in both and can't tell the difference. Schrade uses drawn steel, some blades are forged while others are ground, all depending upon the method preferred by the knife maker. You don't need stainless steel for a good blade if you simply take care of your equipment. Some time ago I acquired an excellent hand made knife from Dale Sandberg - Dale's knives are very unique, extremely strong, very sharp, and the sheathes he makes are very durable. Dale Sandberg of EDMF is pretty much retired and no longer taking orders due to how hard it is for him to work in the shop. He may still have a few outstanding orders he is trying to fill, but after those nothing else will likely be made. A good folding knife with a locking blade is almost mandatory because of their portability. Both Buck, Browning and Puma (among many others such as Russell, Schrade, Case, Cold Steel, Gerber, etc.) make excellent folding knives in a wide variety of styles and sizes. 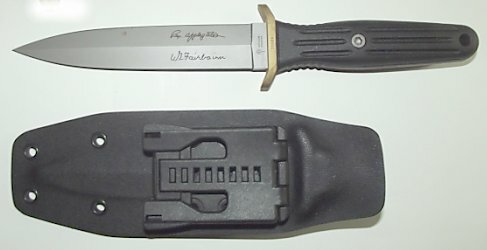 The quality of folding knives is often reflected in their price. If I'm just going to scrape some wood or do some real work that might dull or scratch the blade quickly, I'll use a Case Sodbuster at less than $20.00 every time instead of an Al Mar that cost ten times as much. Knives are available in my Survival Shop. Knives I have owned for almost half a century. Specific use means specialized design for maximum efficiency. Skinning knives are a perfect example. 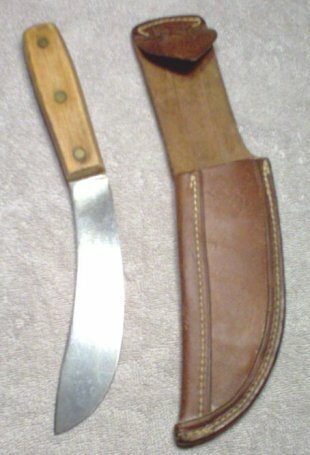 At left is an "Alaskan Skinner" from Herter's, with a unique John Ireland sheath. 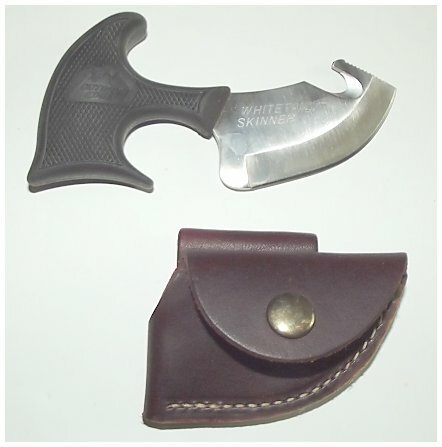 At right is an RH Ruana skinner with a John Ireland sheath. The Ruana is now far too valuable for normal use. I had John Ireland of Murder Lake, AK, make the sheathes for me in 1971. 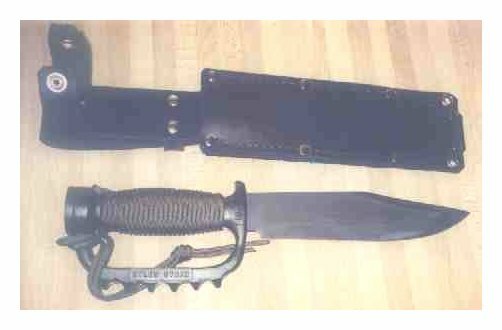 At left, an Applegate/Fairbairn fighting knife. First shown to me by the late Col. Applegate at his home near Scottsburg, OR, in 1980. The originals were unavailable then; this copy was made by Puma. Col. Rex: 6.21.14 - 7.14.1998. 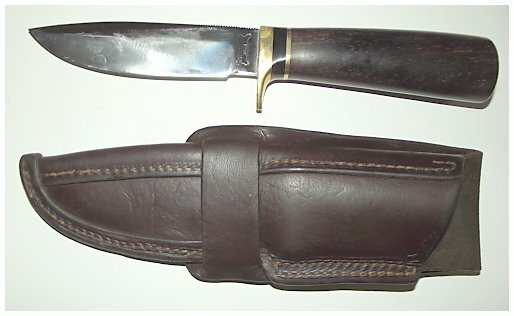 At right, a knife I designed and had made by Ralph Bone of Texas in 1972, in a John Ireland sheath. 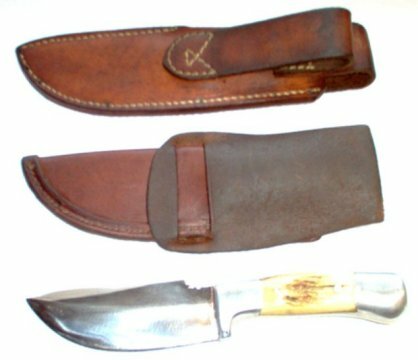 Unique edge of sheath, bottom right. At left, an original, exquisite Al Mar folder I received personally from the late Al Mar at the 1st SOF Convention (in Columbia, MO) in 1980. 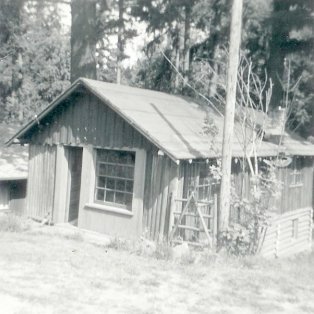 Al Mar was from Tualatin, Oregon, very close to the log cabin where I was born. (Al Mar Knives founded 1979. Al Mar died in 1992. Al Mar knives made now use the name only and are not made by G.Sakai in Seki City, Japan, but are still fine knives.) At right, an Outdoor Edge Whitetail Skinner, still available and an outstanding design and high quality knife. Custom knife hand forged from an old file. 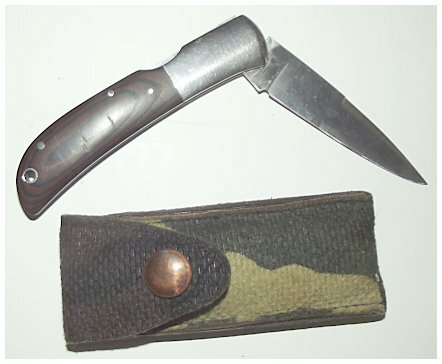 The knife and sheath above illustrate that an outstanding and very useful knife can be made with materials at hand. A large file was annealed twice, hand forged to shape, ground, sharpened, then hardened in a two-step process, the back of the blade being spring temper and the edge only being knife hard. The knife can thus be used as a machete, clearing brush and chopping down small trees, or be a fine combat knife if called upon to do so. The sheath was made from plastic cut from a thick blue 50 gallon barrel, glued and riveted together. If the blade is kept clean and oiled so that it does not rust, the knife and sheath should last for the remainder of my lifetime and another as well. This knife and sheath was made for me by Chip Delyria. Three knives hand forged from old files. The handles were made from dry hardwood found in the forest, shaped and riveted in place using nails for rivets and copper pennies as washers. 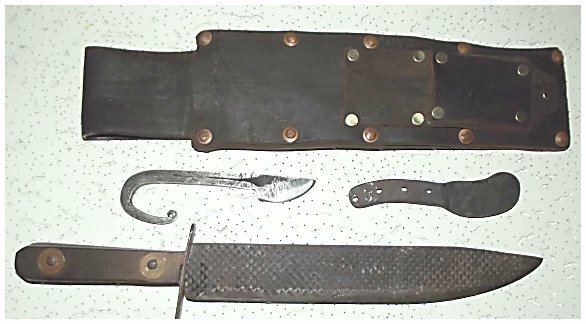 The leather for the sheath was from an old tractor implement power belt found in an abandoned barn, hand riveted so the knives all nest as shown above. The cost? Some nails, rivets, and pennies. Remember, I just scratched the surface with this short article. There are thousands of knife makers and tens of thousands of varieties of knives, and there wouldn't be that many if just one design or maker had the answer for every problem. My only objective was to provide a little guidance. You can't go wrong with any of the knife makers I have mentioned, but you can spend a whole lot more for knives that are not any better. UPDATE FEB. 21, 2019 - "BENCHMADE" KNIVES DESTROYS GUNS AND EXCLUSIVELY SUPPORTS ANTI-GUN DEMOCRATS TO THE TUNE OF $1.2 MILLION!! It pains me as a lifetime resident of the State of Oregon, but Benchmade knives has stepped in it and are now on my personal banned list. Benchmade has spent $1.2 million in their lobbying/political efforts...they’ve solely supported Democrats...Ron Wyden has supported every gun control legislation he has been a part of...As of now, they have not addressed their liberal political support except to deny that they do it on their website.